Budget Belgrade accommodation, central location Belgrade Apartments. In October 2000 Serbia took a decisive step to end its political and economic isolation and embark on the road of European Integration, taken by the whole of Central and Eastern Europe and its neighbors in the Western Balkans. 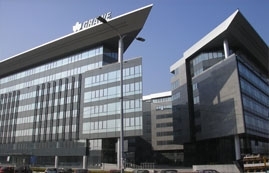 EU is represented in Belgrade with different agencies and offices located in the inner city. The European Commission and its Delegation in Belgrade are working every day to accompany and support this development and the necessary reforms, as identified in the European Partnership, through the European Community’s Assistance instruments. Informing the local authorities, institutions, media and citizens about the integration process and about EU institutions and policies is another key task of the Delegation. Quiet two bedroom apartment, newly furnished, modern and bright, located in very heart of Belgrade. In these elegantly furnished, spacious and comfortable surroundings, you'll feel right at home in the heart of one of Belgrade's most exclusive areas. Perfect location for walking around Belgrade for sight seeing, taking in the ballet, shopping and eating! This is an artistic and creative home, with downtown Belgrade at your doorstep. Accommodates six people. This is a sophisticatedly furnished apartment, located a few steps from the all sights. The area gives you a lot of opportunities to walk to all the attractions in the city. Never the less you will have the entire city center on the doorstep of a lovely flat. This is a typical Belgrade, nice modern, simple minimalist apartment containing all the essentials. Sleeps 4 persons. It has a great location in the heart of Belgrade. Shopping and restaurants are right outside your doorstep. Beautiful bright and exciting apartment located on the third floor. Sleeps 4 in 1 bedroom and 1 livingroom. The apartment has a super location, right in the middle of the town. Close to Belgrade's best public transportation hub, 50 meters from the best cafes and "Knez Mihajlova street", the main shopping street. This apartment is located in very heart of Belgrade. You walk directly on the pedestrian street. Here you will surely find the original "Belgrade atmosphere" and street life. This apartment is spacious and tastefully decorated. The apartment is 100% newly renovated. The apartment is modern and bright 100% newly renovated. You walk directly on the pedestrian street.This apartment is located in very heart of Belgrade.Here you will surely find the original "Belgrade atmosphere" and street life. Very nice charming apartment in the heart of Belgrade. You walk directly on the pedestrian street. The area gives you a lot of opportunities to walk to all the attractions in the city. The apartment has two bedrooms with a king size bed. The apartment is 100% newly renovated. Excellent location in the very center of Belgrade, located next to the National Theater and Trg Republike , Knez Mihailova Street - the most beautiful and famous pedestrian zone in Belgrade, on walking distance to the Ancient Kalemegdan fortress and many head attractions in Belgrade.This cozy tiny apartment measuring 40m2. Modern and "cozy" bright newly renovated apartment in downtown of Belgrade, close to everything, but at the same time, at a calm location. If you want to live centrally and at the same time enjoy calm, this apartment is a perfect choice! The apartment was beautiful and well appointed. The floor plan is designed perfectly & is very spacious. The apartment is on the 3rd floor and there is elevator. We stayed in this appartment during the first days of Easter. Me, my wife and 2 children (aged 3 and 6) had an excellent time. We found it's location good for exploring the city and it was a delight to stay indoors. The light and spacious layout with excellent choice in design of furniture made us in a good mood entering the apartment and waking up. Actually the stay in this apartment inspired us to looking into more design oriented furnitures when we come home. My group of 3 stayed at this apartment for 3 nights in March 2013. In our opinion it is in the BEST location in the City. We found the apartment clean, quiet and cozy. It was the perfect size for us. The reservation process went smoothly and we appreciated that we were allowed to meet someone there early to obtain the keys and to leave our luggage. We had been on a cruise and had arrived earlier then check-in time. The only thing we might suggest is that the binder of instructions include more complete information for tourists such as public transportation information (bus schedules and locations), locations for grocery stores; suggestions for restaurants and sights to see. and instructions on how to use the appliances such as the microwave. The binder should also include information on how to use the automatic door openers. We had company come to visit and they were not able to ring into the house to let us know they were out front. We actually heard them knocking on the door and ran out to let them in. That was kind of inconvenient but it didn't take away from the overall positive stay. Even though this is a busy area of the city, all the noise is away from the apartment. Should we be lucky enough to return to Belgrade, we would not hesitate to stay here again. We stayed at the apartment located at Obilicev Venac. The location is great, it's alongside the central Knez Mihailova street. There are many coffee houses and restaurants around. The apartment itself is nice and clean with wi-fi, air conditioning and comfortable rooms. Last, but not least the kitchen and bathroom appliances are new. The landlord is a really awesome bloke and he will help you out with just about anything. Highly recommended. This apartment suited our needs perfectly. It was spacious, the kitchen was very well equipped and the entire apartment was spotlessly clean. A perfect location, pedestrian area with lot of shops, bars, coffee shops. Excellent apartment with everything we needed. Would highly recommend. Merci beaucoup, l'appartement était très bien nous avons passé un agréable séjour. Lors de mes prochains voyages à Belgrade je vous verrez de nouveau confiance. Are you looking to rent an apartment in Belgrade? Our expertise is Belgrade apartments for rent and we can help you quickly find just what you are looking for. Search through our database of studios, one or two bedrooms apartments for rent, luxury furnished Belgrade Apartments. Once you’ve found an accommodation you are interested in, contact us and allow us to negotiate and manage the rental of your next Apartment Belgrade. We have one of the largest inventories of the best furnished apartments of Belgrade apartments and specialize in working with you to secure your Belgrade apartments rental. We look forward to making your accommodation search simple and successful! We specialize in no commission apartments Belgrade for rent and all your Belgrade apartments rental needs. Browse Belgrade-apartments.net for Belgrade apartments for rent. From furnished apartments Belgrade to luxury Belgrade accommodation. For apartment Belgrade rentals please contact us.